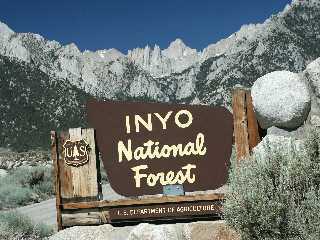 The Inyo National Forest provides several campgrounds within the June Lake Loop. Reservations are available for a limited number of sites. Others are offered on a first-come, first-served basis. Inyo Recreation, a division of California Land Management. Click on the "reserve now" link below, for the campground site you wish to reserve. RVs in all of these campsites must be self-contained: no hookups exist. Located at the eastern end of June Lake, near the June Lake swimming beach and the Pine Cliff Resort. Classic views of June Lake and the dramatic mountain backdrop including our landmark Carson Peak. Upslope on the Southern Shore of June Lake, within the June Lake Village area. Easy walking distance to both of June Lake's marinas, and all downtown attractions. Secluded among groves of trees, yet imminently convenient and accessible. Gull Lake Marina, and walkable to the June Lake Village area. Downstream from Gull Lake along Reversed Creek. Seclusion and a woodsy environment are provided at this location, yet Gull Lake and the June Lake Village are still quite nearby. In the meadow area where Rush Creek emerges and flows from Silver Lake. Only a few steps away from the Silver Lake Resort and Store, Rush Creek Trailhead, and horseback riding at the Frontier Pack Station. Limited Overflow Parking for RVs only is available at this Day Use Area, near Rush Creek a short distance upstream from Grant Lake. A small handful of higher-elevation campsites in Sawmill Canyon, overlooking the Mono Basin. No water. Fire permit required: follow rules for Dispersed Camping. RVs not recommended, the access road is a bit rugged.